Discussion in 'Strategy Guides' started by Tieskevo, Jan 29, 2018. As a new player, I experienced some frustration that you can't view unit upgrades during the combat phase. Which make the 15s build timer kinda short if you have to click on all units and look. Almost as amazing as my leaks. Blasti, Jules, Zitronenritter and 3 others like this. Oh, crap. I swapped the Peewee and Veteran icon..
Maybe it would be more useful to see hp/g and dps/g? Like it's not surprising higher cost units are tankier and more lethal than cheap units, but when you need tanks or dps desperately, it is more useful to consider efficient gold spending. Jules, Tieskevo and Lisk like this. That is an excellent suggestion. And one I'll seriously consider following up on. It does grasp the essention of what i tried to do with the marking of highest dps/health. Hey, I would definitely put down the auras, as aura units suffer a big hp/g and dps/g for the aura effect, also the spell units will look really poor in comparison as well. I would personally make a different mythium sheet, but im not sure really what would be the best way for it. Many things to consider, what to include, what to exclude, and how to keep it tidy and easy to read. Alternative for auras, or maybe in addition to auras, a synergy mark? Like Leviathan is air synergy, star caller is mana synergy and such. @Jules do you recon it is also a possibility to show the upgrades on units during combat? A disabled state. But still readable? It might make the learning curve for new players slightly easier. Experienced players will know these kind of things by heart anyway. But new players got a lot of units to read up on. For all base units we can allready read their stats at all times. This is a good idea, and it's on our backlog (it's a bit tricky to implement). Manegar and deutscherhawk like this. I don't know if something like this would clutter up the info too much, but at least you'd have everything regarding a specific unit at any time. Perhaps some dividers and stylistic elements could help as well. If possible, you could also use a key-modifier to display additional information while holding that key? I can stand behind this, if its only in practice mode. Why remove intellectual aspects of the game aswell as rewarding people that gathers knowledge and improve without some cheatsheet? do you recon it is also a possibility to show the upgrades on units during combat? it seemed easy enough to implement, since they have something like this on their backlog anyway. This only means new players will get some help while learning the game. Experienced players won't read it anyway, since it's really easy to remember anyway. 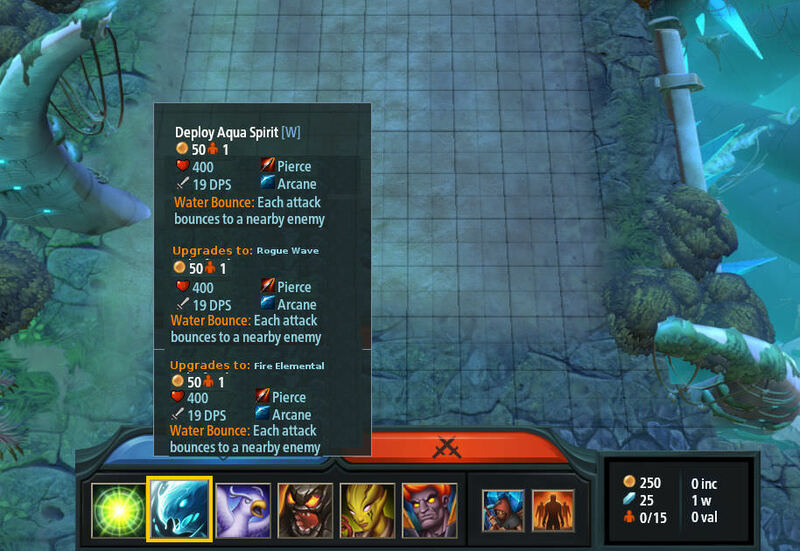 The same applies to wave info and damage/armor types, there is ingame overlays to help newer players. Experienced players will know unit types without overlay. The tooltip is already in the game I simply took Tieskevo's request and added it to the tooltip, since Jules said, it was tricky to implement. As the tooltip already is implemented, they wouldn't need to change much, I guess. But they might have a more elegant solution planned already. I think this would be really nice. I would consider myself by now an experienced player, but I still don't remember the DPS and HP values of most units, and I remember how annoying it was to not know how much money I would need for an upgrade before the building phase starts, since this can make the difference in you sending an extra snail when planing to save or building an extra worker. Anything that lowers the barrier for newer players is a good thing imo.